As of today (Mar. 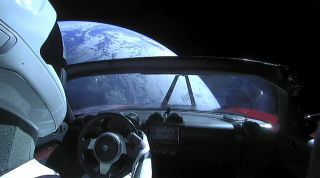 5), the Roadster has reached a distance of nearly 5 million miles (8 million kilometers) from Earth, according to the live-tracking website Where Is Roadster?, which is not affiliated with Elon Musk, Tesla or SpaceX. The car is an estimated 122 million miles (196 million km) from Mars, moving away from our planet at a speed of 7,264 mph (11,690 km/h), the website reported.